What would happen if your playful, sugary-cereal-and-Saturday-morning-cartoon-loving childhood self collided head on with your older, fine-food-loving self? You’d wake up at Coven. I stopped in yesterday to chat with Jen Vourlos, who created this brainchild along with partner Rob Trezza and is busy training staff and setting up, with plans to have a soft opening tomorrow morning. Not all of the foods and services will be available immediately, said Vourlos, but everything should be in order by the grand opening at the end of the month. 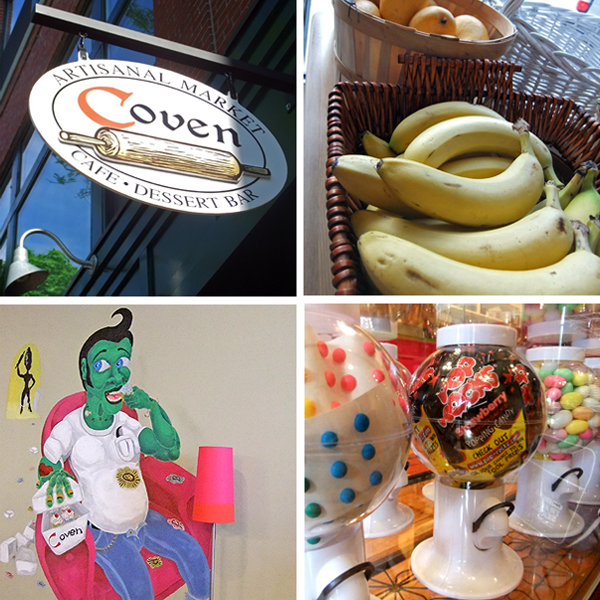 What exactly is Coven–bakery, café, artisanal market? Take all of the above, add vintage toys, games, and a dash of retro rockabilly décor, and you’ve got the idea. This storefront on Essex Street in Salem is a little bit of everything and unlike anything else. Whether you are looking for gourmet foods, local artisanal cheeses, and fresh produce; indulgent and whimsical baked goods; or a casual place to eat, drink and hang with friends, Coven has got you covered. Recent transplants from NYC where they owned a small dessert shop, Jen and Rob moved to Salem to be closer to family and create their vision of making “a change to the everyday cafe experience by providing a place where people can unwind while enjoying unprocessed and freshly prepared foods and whimsical desserts.” The treats will range from cakes, bars, and tarts to things like Nutella cannoli and all-natural, homemade versions of Twinkies and Poptarts. Your inner child will delight in the cereal bar, where you can pour yourself a bowl of anything from Special K to Count Chocula, and the top-your-own-cupcakes with retro favorites like pop rocks. Your date-night self will appreciate a quiet corner to have a glass of wine with a cheese plate and play a favorite board game. Vourlos said she even plans to offer wine and beer dessert pairings. (They have acquired a seasonal beer and wine license and hope to eventually have it year-round.) The gourmet in you will love having a place to buy Richardson’s dairy products, cage free eggs, Voges curry coconut ice cream, or locally made cheese. Coven will be open from 9:00 am to 11:00 pm, serving baked goods, daily specials, sandwiches, salads, deli items, and prepared foods. Everything is available to take out or eat in, and you may find yourself staying just to check out the vintage Smurf collection. Me? I’m looking forward to trying out some to those homemade Twinkies.